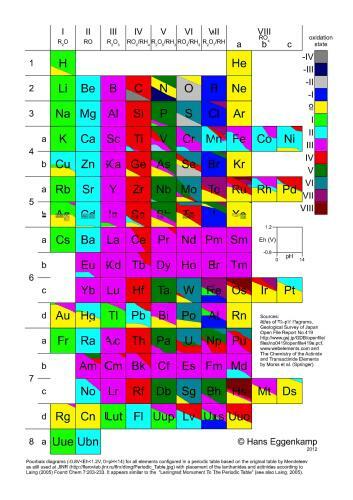 The following Periodic Table of the Elements shows for each elements a colourful Eh-pH (Pourbaix) diagram with the oxidations states coloured. The squares show Eh-pH diagrams with a pH (bottom) from 0 to 14 and an Eh (left) from -0.8 to +1.2V. The oxidation states from -IV to +VIII are coloured, such that the periodicity of the table is very obvious. To maintain this I used the short form of the table as developed by Mendeleev. The Lanthanides and Actinides are shown as suggested by Laing in 2005 (Foundations of Chemsitry, vol. 7, pp. 203-200; DOI: 10.1007/s10698-004-5959-9). Click on the figure for a larger PDF table!! Interested in chlorine isotopes? Go to the bibliography of chlorine and bromine isotopes. Go to my personal publication list.